Closed circuit television cameras with speakers installed in Fortitude Valley and the CBD will have no real effect on crime, according to a leading criminologist, while civil libertarians are concerned about invasions of privacy. Bond University criminology professor Paul Wilson said research showed CCTV cameras did not prevent crime. “It may be good at detecting offenders, but it doesn’t lead to reduced alcohol or drug offenders’ crime – that’s the reality, anywhere in the world,“ he said. Professor Wilson said a person who was drug or alcohol affected would not take much notice of the CCTV or even the speakers. It would be better to deal with such problems in another way. “You could have more police patrols and better lighting,” he said. Professor Wilson also said cameras with speakers attached to them could have many problems. ”Loud speakers and too many cameras have privacy problems with it. It can be seen as unfriendly by the public and the evidence seems to be, it doesn’t reduce crime,“ he said. Even though the cameras may be a deterrent, people would just commit the crime somewhere else. Professor Wilson also questioned the effectiveness of monitoring systems, claiming that the people monitoring video footage spent more time talking than monitoring. “The evidence seems to be a lot of CCTV monitors spend a lot of their time not monitoring but more talking to people and they miss a lot of the events that occur anyway,“ he said. 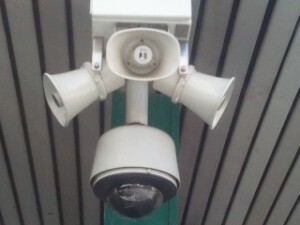 A 2006 comprehensive study of CCTV systems operating at Surfers Paradise and Broadbeach found the use of CCTV to prevent crime was questionable. “From this research it appears CCTV is effective at detecting violent crime and/or may result in increased reporting as opposed to preventing any type of crime,” Professor Wilson said. Queensland Council for Civil Liberties president Michael Cope said there were privacy concerns with CCTV cameras. “Our concern is that they don’t work as a device for deterring crime. Because their usefulness is limited we oppose them being put in willy nilly,” he said. He said data of the footage should be destroyed quickly and not to be used freely by police. “The data should be destroyed within say 24 hours, unless there is an incident you can see on the image like an assault or theft,” he said. “We certainly don’t think that the police should be having access to the images just so they can see that Joe Blogs walked down the hall at 9 o’clock on Saturday. But he said the speakers were a step to improving privacy rights. “A speaker is an improvement. If they told people, stop doing that and move on, it’s probably an improvement as they are giving people more warning that they are being videoed,” he said. When people are walking down the street it does not mean they lose their privacy. “People think you are walking down the street there is no privacy, that’s not correct because of the fact the data is being collected and stored in a database by the government,” he said. Mr Cope said councils should remember that they now need to follow the Privacy Act. “What so many councils don’t realise is that Queensland now has a Privacy Act that applies to them. If they don’t comply with the Privacy Act, then people can make a compliant,” he said. The argument that if you have nothing to hide, you shouldn’t be afraid of surveillance is flawed, he said. “We don’t accept the proposition that if you are doing nothing wrong then you have nothing to hide. In fact most people have something to hide,” he said. He said there were concerns to what those monitoring the footage were actually doing. “There is a concern about what the people who watch these cameras do. There is always a possibility that someone working on these cameras sees someone walking down the street and makes use of the information,” he said. He said that people should wake up to being watched. “The problem at the moment is that we are sleepwalking about surveillance. Surveillance is increasing and we just need everybody in our view to be alarmed about what’s going on and not to see on the basis that if I don’t do anything wrong then nothing will happen to me,” he said. Mr Cope said councils should accept the evidence that cameras do not reduce crime overall. Newsbytes was unsuccessful in getting comment from Brisbane City Council about the cameras. We received no response to the following questions: why were speakers installed? are they being monitored 24/7 and by how many staff? are there examples of the system having foiled a crime or caught someone doing something illegal? and what is the cost of the program?